We come to this 6th World Symposium at a time when we are suffering the consequences of a global systemic crisis that is driving the human species to the risk of extinction. We speak of a "systemic crisis" to refer to the failure of that set of values, regulations, policies, and actions that operate as a substrate of beliefs and attitudes (psychosocial background) in favour of the interests of a tiny but powerful global elite that imposes the rules of the game and organises the power that subjugates states, institutions and individuals. A system that has capital and accumulation as its central value and that is still sustained without being questioned by a significant part of the world's population. ​This global social destructuring is manifested in the unjust distribution of wealth that condemns millions of people to marginalization, hunger and an uncertain future. A recent Oxfam report warns that in 2017, 82% of the world's wealth generated that year went to the richest 1% of the world's population. This destructuring is also manifested in growing violence, accompanied by military interventions by the major powers and its inverse, terrorism; in the meagre action against climate change and in an unsustainable consumerist lifestyle that puts our common home at risk and whose greatest consequences are suffered by the poorest; and, above all, in the failure of neoliberalism – an economic model that has shown its true face and contradictions, by generating two international financial crises that have hit the world economy –, enormous unemployment and the proliferation of corruption. In Latin America, this reality is expressed in institutions that have lost all credibility and are beginning to collapse, undermined by corruption, amidst the weakening of democracy and the loss of rights of the populations; and particularly in public-private partnerships that have shown their worst side, given the major corruption scandals. Although several countries have made significant efforts in the last decade to promote an improvement in the quality of life of their populations and to reduce extreme poverty, through so-called social programs, the myth of consumption-based growth has spread, with strong restrictions on social rights (health, education, social security) and the growth of unemployment in several countries. At the same time, we feel and acknowledge with hope the germ of a new sensibility that is emerging from the profound needs of diverse human groups, intentions that are carving out new paths and orienting themselves towards the construction of a new planetary society in which human life emerges as a central value in the face of the power of capital. Thus, we can see the commendable resistance of important sectors of social movements from different parts of the world in defense of their rights, such as the women's and youth movements; in the tremendous demonstrations against transnational corporations and governments of powerful countries that are resisting the fight against climate change; as well as in countries that are successfully testing other forms of institutionality. Likewise, we can see how creative initiatives in which the ‘we’ is put first and money is displaced as the central value of society are expanding. Within this framework, the VI Symposium seeks to deepen the understanding of the roots of this systemic crisis, and at the same time to promote the exchange of experiences and reflection on new paths that will lead us to another way of life and society, with the changes we need to make and how to make them as effective as possible. It depends on us! We are 99% of the population! Today more than ever we need to propose and develop strategies that will lead us to the great change we want to promote in Latin American and global society! 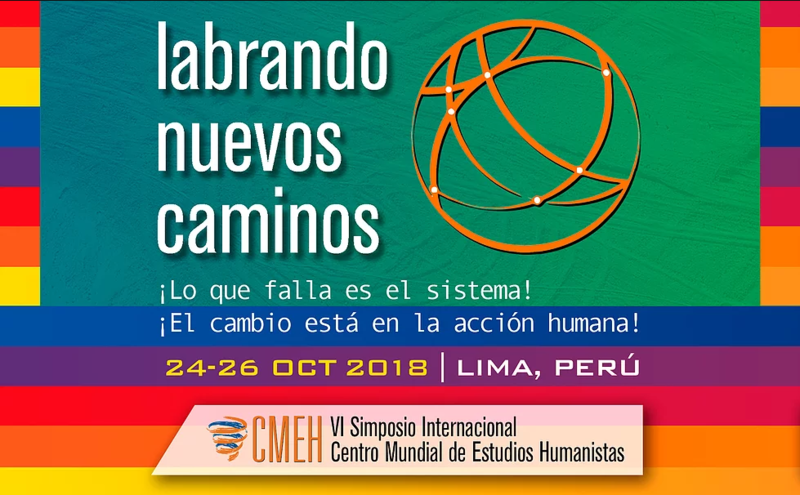 The World Centre for Humanist Studies proposes this Symposium as a privileged forum for exchange, since only communication and joint action will make it possible to build the future desired by the human spirit: the birth of a Universal Human Nation whose outraged cry is already in the streets and squares of every country in the world.